Apo-Diclo EC (Diclofenac) is an analgesic used to relieve pain and to treat inflammatory disorders such as arthritis. Its mechanism of action involves inhibiting the synthesis of inflammatory prostaglandins, which are hormone-like substances that the body releases as part of its reaction to injury or some medical disorders. 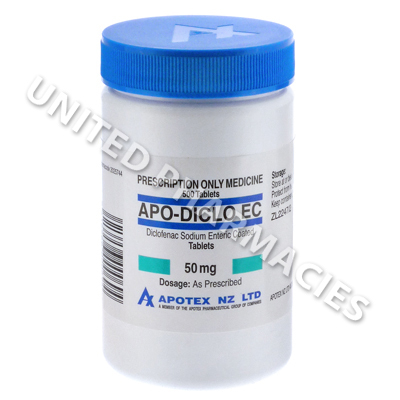 Manufacturer : Apotex NZ Ltd.
Apo-Diclo EC (Diclofenac) is an analgesic used to relieve pain and to treat inflammatory disorders such as arthritis. Its mechanism of action involves inhibiting the synthesis of inflammatory prostaglandins, which are hormone-like substances that the body releases as part of its reaction to injury or some medical disorders. They are known to promote inflammation. A chemical called cyclo-oxygenase (COX) plays a vital role in the production of these prostaglandins, however, by inhibiting its action, this medicine helps to stop the bio-synthesis of these prostaglandins, which are known to mediate the inflammatory response. Doctors widely use this medicine for patients with many different types of musculoskeletal disorders, including (but not limited to) rheumatoid arthritis, osteoarthritis, ankylosing spondylitis, gout, frozen shoulder, tenosynovitis and bursitis. It is also indicated for pain management caused by kidney stones or injuries (including sprains and fractures), and is sometimes used for post surgery pain. Additional uses include fever, tooth pain, migraine headaches and other disorders which are not mentioned here. Apo-Diclo EC (Diclofenac) comes as enteric coated 25mg strength tablets, meaning that a special polymer barrier is applied to the outside of the tablet. Careful consideration will be needed by your doctor when deciding upon the right dosage, and numerous factors will need to be considered, including the condition being treated and the severity of symptoms. Adults treating acute pain which ranges from moderate to severe in nature may be told by their doctor to take 100mg to 150mg per day (as 2 to 3 separate doses). This dosage schedule may not be used for all patients, and those treating mild pain or using it on a long term basis for the relief of chronic pain may be treated with a lower dosage. The tablets should be swallowed whole and not crushed or chewed. You will need to make the doctor aware of all side effects that are experienced during treatment. Reactions that are serious and will require medical attention straight away include seizures, reduced urination, unusual weight gain, soreness when urinating, severe fatigue and others that are not mentioned here. If your doctor recommends treatment on a long-term or prolonged basis, or if you have suffered from ulceration of the stomach, you may be advised to take the medicine alongside meals so as to lower the risk of ulceration. Patients may be treated with the lowest possible dosage for the minimum period of time needed to achieve effective results. This will help to ensure that the occurrence of ulceration is less likely. Always use Apo-Diclo EC (Diclofenac) as you have been prescribed by your doctor. Never self-medicate or change your dosage without first consulting your doctor. The correct dosage can vary depending on your health, medical history, and the severity of the condition being treated.